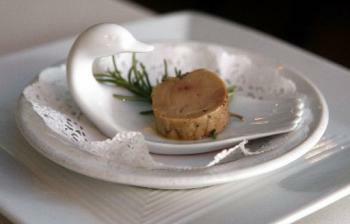 To prepare the salt cured foie gras, combine the kosher salt, sugar, dry spices, sel rose and black pepper. Season the outside of the foie gras and wrap it in several layers of cheese cloth, tying it at each end tightly. Submerge the cloth in an earthenware dish so the package is completely surrounded by the salt mixture. Refrigerate for 2 days. Shave pieces of foie gras off as thin as possible or slice thin rounds. Garnish foie gras with a simple salad and a sweetish confit e.g. red onion or fig . Hi. What is the shelf life for this? For both refrigerated and frozen? Thank you.